Power amps: Canary Audio CA-301Mk2 [on loan], Alter Philips monoblocks. Ancillaries: Kondo KSL LP and Kondo KSL VZ interconnects; Kondo SPC speaker cable and Kondo KSL ACz power cords; Clearlight Audio NFT cabling; Silver Arrow cabling and mains leads; Audiomagic Mini Stealth conditioner, Incognito wiring on Conductor and Hadcock 242, Living Voice Mystic Matt, Boston Audio Graphite Mat, Cartridge Man Isolators and setup tools, Dr. Feickert protractor. 2 x separate 30 amp mains wiring spurs. 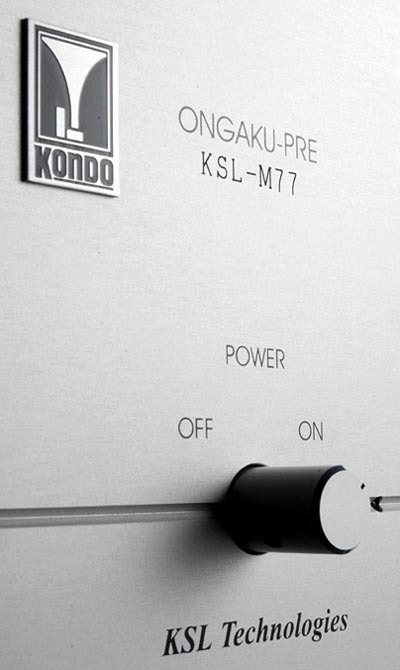 What's it like ordering a Kondo KSL M77 preamp? I have a Scottish skipper friend called Neil. When he was young, he and a mate found themselves on the roof of a five-story hotel in the Med. The hotel was smack on a cliff overlooking the sea. Night. Way too many beers, way too many stars, a ton of teenage manhood to prove. They look down at the black water, up at the glittering Milky Way. The inevitable is going to happen. 64 meters, 180 feet down. I'm not sure they figure out how fast they will drop but it's probably close to terminal velocity. And they stand, and they look at each other, and they look again and together they jump. The void under your feet. No going back. Most of the people who order Kondo equipment are, I assume, zillionaires but for those of us who sweat to pay the council tax and have to take the bus home, you have to seriously ask yourself if a) you haven't totally lost grip on reality and b) who the hell are you kidding? Music and adrenaline fan that I am, I would still never have done it had I not heard Kevin Scott's system up at Definitive Audio. It wouldn't have crossed my mind. I sort of belonged to that levelheaded group who feel that expensive audio is not just a mugs game but vulgar and somehow wrong. I mean, what the Fledermaus are you trying to prove? Get a life pal. But then, minutes into the first bars of Vivaldi's Gloria, I knew I was going to move heaven and earth to get a hold of these magic boxes. And heaven and earth I moved. Goodbye beautiful 28-foot 1958 wooden sloop (not to mention its vicious mooring fees). Goodbye collections of this and that, goodbye door handles, spare loo seat, just about everything that wasn't nailed down in the house. The craving is on. And with the craving, the fear. What if I don't get anywhere near what Kevin gets in his room? Or what if I get a huge kick out of it and then months later just take it for granted? And why the hell don't I get a life? Then there were the financial considerations - I'll have to take a heavy hit if I ever have to bale out and sell this thing. Stress level meter way into the red zone. Then the wait: Think dropping down at night into an invisible sea but it goes on for months. Three months to be exact. The M77 is built to order and those wizards out in Tokyo take ages hand-making their resistors, capacitors and transformers. It's serious Japanese craftsmanship. Time passes slow enough to go through a ton of emotions, most of which have to do with "is it going to be good?" vs. "you effing, effing idiot". How could I spend so much money... on a preamp? I've mentioned before how stunning I thought the Canary 903 SE preamp is. Four boxes. Dual valve power supplies. The sound is truly exceptional. In the weird maze of audio, they were my Ariadne's thread, the things that made sense of music and music of sense. With Kondo, you have to go all the way up to the £50,000 M1000 to get two boxes and the separate outboard valve power supply. More anxiety. What if all those exotic hand-made resistors and age-annealed silver wire just didn't add up to much? What if Kevin was piping opiates through the air ducts of his listening room? The Kondo hasn't even got a stepped attenuator, let alone two. The doubts nag on like some weird leitmotif across the spring and early summer. And finally, two weeks before I've got to leave the country for months, the call: "Your M77 has arrived." This is like going out on a first date with a super model. Or taking a trip on the space shuttle. One long car trip later, the symbolic cutting of the box tape. Out comes the preamp. Instructions. Certificate of provenance. And the thing itself. A very heavy box with a copper lid painted black and an understated silver fascia. The logo reads ONGAKU-PRE KSL M77. 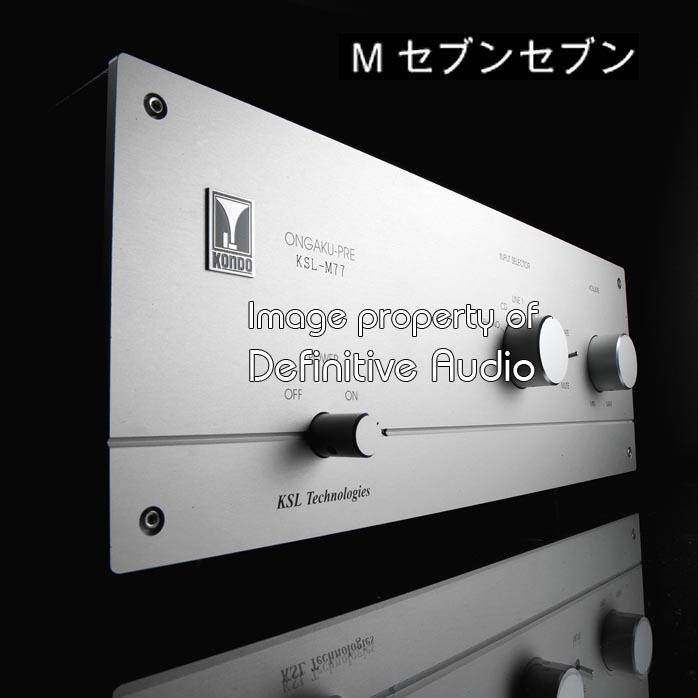 Ongaku takes us back to the legendary integrated amp itself, the one that made Kondo famous. In those days when huge American solid-state amps ruled the audio roost, the arrival of an amplifier using valves in a single-ended topology seemed almost surreally anachronistic. 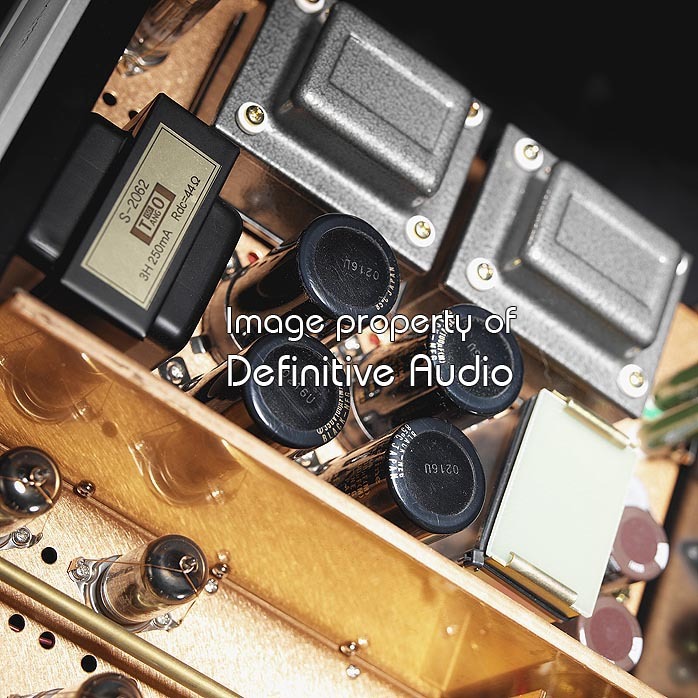 The Ongaku, though arrestingly expensive, almost instantly became the most coveted amplifier in the world, and so began the reaffirmation of valve amplification in general and the theoretical fascination with SETs in particular. We are of course still living with the consequences of that trend today. I must admit that I'm still fairly unmoved by most of the SE 300B amps I hear though on the very rare occasions when it works, there are few amps that rival them. Mr. Kondo's amplifiers were different. It's not just that he was the son of a Buddhist priest or a professor of electrical engineering and molecular metallurgy. It was his uncanny ability to fuse hard engineering with profound insight into the wonders of music that made him into the "Picasso of contemporary audio design". In brief, there is nothing quite like a Kondo amp and when you hear one, you just know. Sidebar: Do not, under any circumstances, confuse products made by ANUK (Audio Note UK) with those from KSL Kondo in Japan. The two companies have absolutely no relationship whatsoever. plate with the gold-plated input sockets, a plug socket and the phono ground. The finish is excellent, superb really, though not necessarily in the audio jewelry category (not that I can judge that anyway but apparently Japanese audiophiles study amp casings with a jeweler's loupe). So far, so simple. It's when you open the thing that its true glory appears. The copper chassis with its Bauhaus functionality (the copper acts as a Faraday cage) shines like the inside of a treasure box. The eight 6072A valves in two groups of four are held down with fine copper restraining ropes on each valve. Let's not get too fetishistic about it all but hey, check out the two mains transformers and the solid silver wiring. Mr. Kondo didn't use silver just because it was fashionable - he was the first person to use it in audio electronics. There is a sense of the 'perfectionist-driven' attention to detail that is key to Japanese art and culture. KSL Kondo draw their own silver wire which is then age-annealed for up to ten years. These wires are then hand-polished and hand-coated with six dielectric layers of polyurethane varnish. There is other wizardry, too, which isn't divulged publicly. One has to wonder what those pesky electrons make of it all as they trip the light fantastic down the silver conduits. Have they ever been treated so respectfully? The way metal is shaped and drawn from the ingots is something that cartridge designers have been looking at closely for a long time. Allaerts cuts his cartridge pins from pure blocks of iron so as not to disturb the molecular structure. Van den Hul's cables and cartridges also take up some aspects of this issue. One can only dream about what an audio system would sound like if it was wired with unbroken Kondo wire from wall plug to speaker voice coil. Not a lot of information here although in these days of instant Internet access and cheap Chinese clones, it's no surprise that KSL Kondo (and Living Voice for that matter) are reticent about the magic in their craft. However, the issues involved go much deeper than that. The basic ingredients of valve amplification are familiar to every audio designer: circuit topologies, component materials and construction techniques of capacitors, resistors, transformer windings and so on. These are just the ingredients, the building blocks. But even if you bought an M77 and took it apart, it would not yield up its secrets any more than a Samurai sword would. Give me prawns and some batter and I will not come up with the divine poem that the Nobu restaurant gets out of the shell fish. How does Masaki Ashizawa, chief designer at Kondo and now company president of KSL Kondo, achieve these amazing heights? I want to suggest that it has a lot to do with the way Japanese culture produces these artist-artisans who have an extraordinary ability to focus on the intricate properties and very essence of physical objects; on matter itself; and then find a way of connecting it to what is transcendent in the human experience. There's a Zen focus and concentration which takes something simple and transforms it into something both humble and ecstatic. In the West we can be 'ends oriented' and use tools and matter to get the results we want. For the Japanese artist, the process is sacred, the methods are sacred and the act of creating something simple is considered the noblest achievement man is capable of. This intense and spiritual relationship with physical matter and its counterpoint in our souls can seem bizarre to us. Have a quick look at the late Mr. Kondo talking about silver. You'd think he had taken leave of his senses. "I want to produce a sound in which its individual particles may radiate energy into the ambient space just like the sun and fuse into one." Hiroyashu Kondo may have been semi mystical in his relationship with physical matter but as befits a professor of electrical engineering and molecular mechanics, the engineering on KSL Kondo electronics is of the very highest order. Kondo is not about peppering fairy sprays on components in the hope something will happen. It is about rigorously looking for many years at how best to achieve a certain sound and adopting the technical solutions for getting there; investing in the equipment, in highly trained staff and research time to achieve it. But above all, it is about approaching the task with a dedication that borders on the obsessive; a love of music that acts as spur; and great humility which has been a characteristic of the Kondo aesthetic from the beginning. With research you can find out that the M77 mains transformer and chokes are produced by Tango. But what you won't find out is what winding technique they specify, what core material, how thick the leaves are and so on. This is the kind of thing that Kondo-San focussed on so closely. Or rather, he had an extraordinary ability to be able to find the melody in a metal. I've been fairly disappointed in silver as a cable material. To my ears it usually sounds brittle, metallic, grainy and opaque. But in Kondo's hands, the same material becomes fluid and kind and supple and generous and incredibly transparent. Of course the techniques are important, surface treatment and dielectrics are issues. But I suspect that if you're serious about wanting to get near the territory of Kondo, the only way is to follow Jonathan Carr of Lyra's example, move to Tokyo and try to convince the masters to let you sit and study at their feet for twenty years. I suppose what I'm saying is that it simply isn't possible to copy a great master who has a profound relationship with a 2000 year-old culture of approaching work. Think of what it takes to become a Zen Buddhist monk. Think what it takes to make a great wine or a great musical instrument. It's that kind of commitment and dedication that is required if we are to achieve similar results. Anyway, reader, I switched on. And over the next few days, I listened to a lot of music. And music that previously hadn't quite made sense -- hadn't worked -- suddenly made me feel emotionally alive, a better listener, really in the zone. With other material, it was like those scenes where the drug addict straps up in an alley, injects and his eyes suddenly blur with the deepest, most intense physical bliss ever experienced by a human body. He hasn't got a clue, that guy, how deep music can go. I was focussing in on what was blurred and confused before but not just from an audio point of view - from the point of music. Songs that I didn't get suddenly became heart tugging and mind expanding. Transparent is the wrong word - that implies a hi-fi quality but this was a musical and artistic transparency as if layers of invisible grunge and gunk have been scraped away. Each vibrant note is suddenly here. Its like love; deep, rich and dense - you don't rationalize it, you just fall into it. The colors, textures, timbres, intimacies and associations are richer, fuller and more meaningful. It's a 'more body' thing, a 'more spirit' thing, a more 'mind' thing. This is the kind of sensation money can't buy. It's Barry's love song. It's Frankie's timing. It's Brahms' bravado, Beethoven's beliefs, Vivaldi's credo and Messiaen's morning muse. Can I stop here? Right away I know I can't. Is it worth it? Forget about it. I've got to push on for Gakuoh land. There are so many aspects that are incredibly special about the sound of this preamplifier. There's a lightness of touch to the bow stroke on the Bach that has me shaking my head in wonder. How to describe it? In some ways it's very simple. With the M77 in situ, that amazing quality I first encountered at Definitive Audio is there. There is a level of presence, tone richness and a particular three-dimensionality to it. Voices soar, dive and swoop like swallows on a summer evening. The texturing is superb, dense, rich, vibrant and effortlessly communicative of the inner flow of the notes themselves. It's incredible. Substitute the M77 with another preamp and the sound suddenly goes flat. We're back in hifi land. Using my previous benchmark preamp on Vivaldi's Gloria [L'Oiseau Lyre 455 727-2 on original instruments], Carolyn Watkinson's contralto now goes from loud to soft in judders. It sort of leaps back and forth. It's fairly pure when it's sustaining but as it lifts, there's distortion in the vocalizations and almost a shuddering. The violins are glassy and strident and bland in a way I'd never noticed before. See how fast one comes to assume a certain quality of sound and how rude the bump is when it's suddenly taken away? Above all though, the indescribable gestalt of the piece is gone. The musical meaning. The emotional quality that turns this into great art. Frankly, I can listen to this Gloria on a radio and just walk right by it. Not interested. But put it through the M77 and alchemy occurs. It becomes the kind of music that you'd be proud to put in a rocket to send off for our alien cousins to listen to. "Hey, guys, check this out". Hell, it becomes a good candidate for the piece you want to use for the final credits of the Universe. We get transported into a world of spiritual longings, ecstasies and despairs that takes the inner emotional self on what I can only describe as some kind of minor mystical transport. It can often reveal, in the superficially banal, something simply earth-shattering. The Kondo M77 is the only piece of audio equipment I've heard do this - which is why it exists at the very pinnacle of Parnassus.